Colds and the flu season is in full swing. The flu definitely lays you down fast, but a cold can be just as bad. It is easy to overlook how important it is to keep our immune system healthy for when the critters want to pay a visit. All of a sudden you think you are coming down with something because you have itchy watery eyes, sneezing, congestion, achy and feeling… oh so tired!!! Not to worry– I’ve got you covered. Now, before you go into panic mode and run to the nearest retail store to purchase a few boxes of OTC medications or what I like to call —pharma band-aids, because they do not target the root cause (the virus) let me tell you my about my secret elixir. Back to the remedy. I highly recommend using organic ingredients because you will be using the whole fruit. But if you can’t get organic, rinse the fruits with vinegar and or soapy water to –sort of reduce the pesticides and micro-organisms exposure. I like to add a few drops of echinacea tincture to Adults tea once it has cooled a bit. However, kids may not like the bitter flavor at first. I try a drop in their tea and see their reaction, but you can skip the tincture altogether and boil echinacea in its raw form (herbs) then add the lemon, honey ginger syrup to that water to make a kid-friendly tea. Step 1. Peel, slice clean the ingredients. Step 2. I like to use mason glass jars or you can use any glass container with a cover. In no particular order add lemon, ginger and limes until the jar is filled to the top leaving about an inch of space from the top. I use lemons or limes on a daily as the main source of flavonoids, and vitamin C (This is what I take) Whether I use them in my warm lemon water in the mornings, vegetable juices, in a cooler tea during the summer or a delicious cozy tisane during the winter –they are a staple in my house. Lemons and limes contain unique flavonoid compounds that have antioxidant and anti-cancer properties. Of special interest in limes have been flavonoids called flavonol glycosides, including many kaempferol-related molecules. While these flavonoids have been shown to stop cell division in many cancer cell lines, they are perhaps most interesting for their antibiotic effects. Furthermore, lemons and limes are an excellent source of vitamin C, one of the most important antioxidants in nature. Vitamin C (This is what I take) is one of the main antioxidants found in food and the primary water-soluble antioxidant in the body. Vitamin C travels through the body neutralizing any free radicals with which it comes into contact in the aqueous environments in the body both inside and outside cells. Free radicals can interact with the healthy cells of the body, damaging them and their membranes, and also cause a lot of inflammation, or painful swelling, in the body. Step 3. Pour Manuka honey and local raw honey over the ingredients until they are covered. Stir to ensure all of the ingredients are covered in the honey. Ginger is a natural anti-inflammatory which helps with sooth a sore throat, target inflammation in the sinuses but mainly inflammation in general. Ginger has a long tradition of being very effective in alleviating symptoms of gastrointestinal distress according to this article. In herbal medicine, ginger is regarded as an excellent carminative (a substance which promotes the elimination of intestinal gas) and intestinal spasmolytic (a substance which relaxes and soothes the intestinal tract). Modern scientific research has revealed that ginger possesses numerous therapeutic properties including antioxidant effects, an ability to inhibit the formation of inflammatory compounds, and direct anti-inflammatory effects. Step 4. 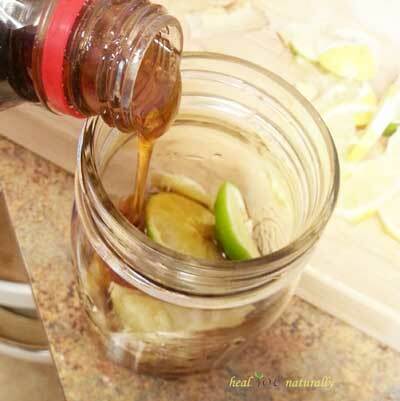 Let the mixture sit for a day or longer to allow for ginger, lime, and lemons to infuse into the honey. Cover the mixture and store it in the refrigerator for several months. You can just eat a spoonful of the mixture at the onset of symptoms and throughout the day or add a tablespoon to your favorite tea. I hope you don’t get sick this year, but if you do I sincerely hope this remedy can help you or a loved one. How do you prevent colds and the flu? What other home remedies do you use to treat them naturally? Share your experiences and comments below. If you have kidney or gallbladder problems you may want to avoid eating lemon or lime peels and oxalates. Do not give honey to infants under one year old. Why? Honey contains an enzyme that their little stomachs can’t digest.